And then all the fire was suddenly gone. Blaaaaanky. Despite how he’s supposed to be a generic hero parody and despite what he’s about to do to my dear villain, I am growing rather fond of him. His sword looks different than in the banner. Wow that banner is just really outdated, isn’t it? Don’t freak out too much if you check back one day and there’s a new one. Skärva has already had a mug of scalding brown liquid thrown at him. Also isn’t there a button or something? Or is it not that simple? Nah, it’s supposed to be voice-activated I think. Maybe it’s out of batteries. Argh I know. Don’t look at that banner. …Ok, so it’s kind of hard not to, I suppose. lol how many pags total?? 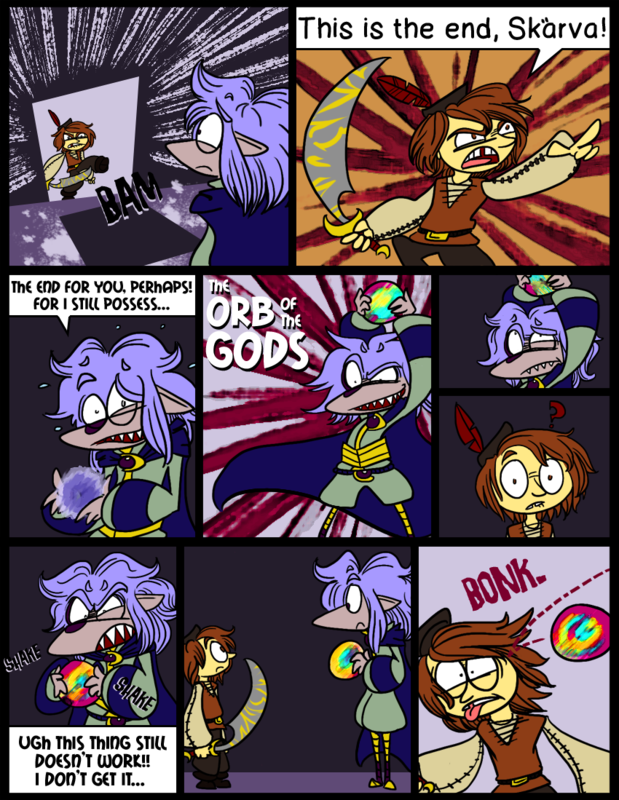 orbs of the gods say “BONK.” all the time. Just kidding, I’d be.. WHOA. Almost 80 by the time this comic was over. Holy CRAP. but my actual question was how many pages since u started? You’re a quick thinker AND spiteful. I can respect that. You won’t be killed, Bikke, I mean, Skärva. aw i like Blank. he’s so adorable! Huh. Blank’s much more capable than he looks. that’s the big problem with many bosses. “lets use this same energy attack over and over again that he keeps reflecting!” instead of “lets use this magic/magical item to hit him with very heavy objects!